When mentioning my interest in historic arms and armour in general company, I often find that people immediately respond with tales of their own experience with these artifacts. At a family gathering in Morris, Alabama, a few years ago, my wife's older cousin, Dennis Swann, responded to my hobby by remarking, "Well, I guess you should inherit our Civil War sword then". Such a comment would be enough to stop any edged weapons enthusiast dead in his tracks, but I live in the deepest part of the Deep South, and the prospect of a rare, provenanced Confederate sword in the family literally took my breath away. As it turned out, the full story was more surprising and only slightly less spectacular than the Confederate sword scenario. It seems that my wife's great-great grandfather had been hunting in the vicinity of Turkey Creek near Morris (19 miles north of modern Birmingham) in the late 19th century when he found a cavalry saber and scabbard. He passed it down through the generations of my wife's family and it was stored in a closet when I first heard about it. The owner generously passed it on to me and my wife the Christmas after he learned of my intense interest in the piece. At last, I could examine and document the weapon in detail, research its history and give it an honored place in my collection. This weapon is an enlisted men's pattern U.S. Model 1860 Light Cavalry Saber, made by the former scythe-manufacturing firm of Mansfield & Lamb of Forestdale, Rhode Island. It is in remarkable condition, no doubt owing to the fact that it was recovered within a decade or two of being lost. The brass hilt, like the rest of the weapon, is in untouched condition and is surprisingly tight, with only a slight wobble. The rear quillon is bent at a 45-degree angle toward the pommel but is otherwise undamaged. The spirally fluted wooden grip is in excellent condition, with a dark, glossy shine, but lacks its original leather wrap and wire binding (although slight traces of both survive). The iron scabbard has a rich, dark brown patina with light pitting overall. Its suspension rings are intact and the scabbard's only visible damagetwo small dents on the outside face of at the distal endmay in fact be intentional and contemporary with its working life. Similar dents are often found on combat sabers and it is commonly believed that cavalrymen made the dents to prevent the blade from rattling in the scabbard. I am especially intrigued by the raised rim at the mouth of the scabbard, which is made as a separate piece and includes a simple internal leaf-spring mechanism to help retain the weapon. This device works perfectly, but the sound of metal scraping against metal when drawing the saber is enough to chill the blood of any collector of antique edged weapons. The blade has a smooth grey patina overall and one very small nick in its edge, but is otherwise pristine. The edge is not particularly sharp but the point is acute and quite deadly looking. A small remnant of the original leather washer remains between the ricasso and guard at the back of the blade. The inside of the ricasso bears the manufacturer's name and city. The outside of the ricasso is marked U.S., C.E.W. (For Charles E. Wilson, the inspector who accepted the saber for the federal government) and 1864. 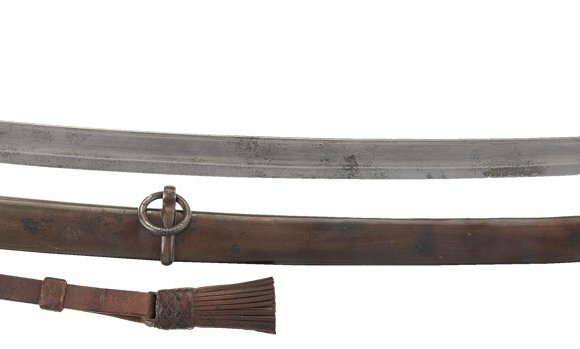 The Model 1860 Light Cavalry Saber, which actually appeared in small numbers as early as 1859, gradually replaced the Model 1840 Heavy Cavalry Saber. The Model 1860 then remained in use through the Civil War and Indian Wars and finally was superseded by the Model 1872 Light Cavalry Saber. Even examples dated to the Civil War era are relatively common and may be found for between $500 US and $1, 000 US. However, I soon learned that the saber in my collection may have a much more interesting history than the average example. The saber's date of manufacture and its reported place of recovery strongly suggest a connection to the famous "Lost Brigade" of U.S. Cavalry Brigadier General John T. Croxton. North Alabama saw relatively little Union military activity until "Wilson's Raid, " the famous Alabama excursion of U.S. Army General James Harrison Wilson in late March and April 1865. Headquartered in Elyton (modern Birmingham) in late March 1865, Wilson dispatched Croxton and a brigade of 1, 500 troops (including the 4th Kentucky Mounted Infantry, 6th Kentucky Cavalry regiment, 8th Iowa Cavalry, and 2nd Michigan Cavalry) to the west to destroy the town of Tuscaloosa's industrial and military facilities, including the University of Alabama. This they did, but they became lost afterward (earning their nickname) and ran into a superior Confederate cavalry force under the command of Brigadier General Wirt Adams. A running skirmish ensued, and the official US Army report of what happened next may hold the key to our saber's history:"Fearing to risk an engagement with a superior force, backed by the militia, he [Croxton] countermarched and moved again in the direction of Tuscaloosa; leaving it to the right, passed on through Jasper, re-crossed the West Fork of the Warrior River at Hanby's Mills, marched nearly due east by the way of Mount Pinson and Trussville, crossed the Coosa at Truss' and Collins' Ferries, and marched to Talladega. "The route described in this report took Croxton slightly to the north of Morris, and the brigade may have crossed Turkey Creek or ridden alongside the creek virtually anywhere between Morris and Pinson. So, the simplest explanation for the saber's presence in the vicinity of Turkey Creek is that it was lost by one of Croxton's enlisted cavalrymen in mid-April 1865 (Croxton reached Talladega by April 21). I have found no other record of Federal cavalry activity in the area of the saber's finding, but neither is there any record of fighting along this part of Croxton's route. So how was the saber lost? Perhaps our cavalryman had stowed the weapon behind his saddle for the dash through the densely forested Appalachian foothills and failed to notice when it was dislodged by brush or while clambering up the south bank of Turkey Creek. However it departed from the cavalryman, it remained where it fell until found in the 1870s or 1880s by Ambrose Doss, who shared the name of a father killed by Federal artillery at the Battle of Atlanta. If this informed speculation about the saber's journey through North Alabama is trueand I believe it is the most plausible explanationour saber was almost certainly present at the burning of the University of Alabama. It is therefore especially appropriate that the weapon now resides with fans of the Auburn University Tigers, UA's traditional rival in football and all other athletic affairs. The 1st Cherokee Mounted Rifles was a Confederate States Army regiment which fought in the Indian Territory during the American Civil War. One of its commanders was Stand Watie.